The Mergui Archipelago is a chain of 800 islands off the south eastern coast of Myanmar in the Andaman Sea. The Mergui Archipelago is inhabited by the indigenous moken tribe; a minority of sea-dwelling people who follow a traditional way of life that can be seen living on their boats in the dry season. The islands, which are so remote they only opened up to foreign tourism in 1997, have barely been explored. The absence of a tourism industry means it’s only viable to visit the Mergui Archipelago on a live aboard cruise. Since the general election in 2010 and the lifting of the tourism boycott, the red tape is loosening and superyachts can now visit these islands. The entry port to Burma, now known as Myanmar, is Kawthaung. Before arriving, charter yachts must gain a cruising permit via an agent. A visa-on-arrival will be issued for crew and guests, valid for cruising the Mergui Archipelago. For the mainland, the agent must obtain Myanmar tourist visas for all. Visiting yachts must have an official guide on board, arranged by the agent. Some islands are off-limits – the guide will know the latest information. He’ll also have the paperwork that proves to the Myanmar Navy that the yacht is allowed to cruise in the archipelago. For more information, go to asia-pacific-superyachts.com. 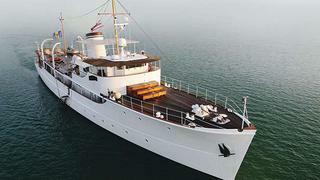 This 41.5m minesweeper was turned into a superyacht by Irish tycoon Thomas Loel Guinness in the 1950s. She offers spacious decks, elegant décor and cosy interiors for 12 guests. 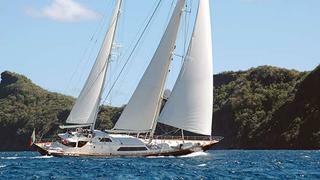 This 1983 Perini Navi blue-water sailing yacht was refitted in 2004. The 40m features cutting-edge sailing tech and chic interiors with cream upholstery and warm wood. 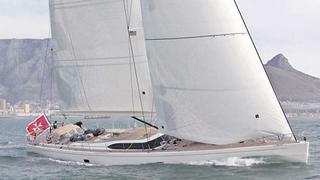 This 30.2m Southern Wind sailing yacht was delivered in 2009. She features a bright, modern interior with a spacious saloon, as well as a comfortable alfresco dining area.